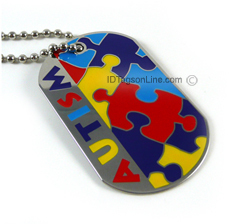 Autism ID Dog Tag. Autism ID Dog Tag. Free shipping. Autism Single Medical ID Dog Tag, IDNS16 (1 1/8"x2"), is made from .031" thick nickel plated stainless steel and has hand applied enamel colors. The two sided design utilizes the familiar autism puzzle pattern on one side and the opposite side has a write on surface that can be used for "name" and "phone #" information, written by permanet marker. Image shows front and back of the Dog Tag.